Early May in Michigan means trees and tulips blooming, green bursting from the landscape, and completely unpredictable weather. 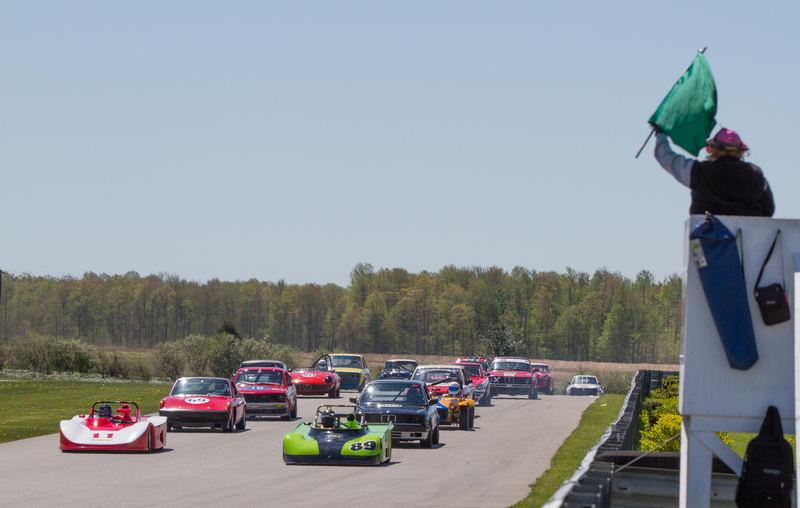 The Vintage Sports Car Drivers Association (VSCDA) has seen everything from sunny skies to snow flurries over the years for its annual Spring Brake Drivers School and Race Weekend at GingerMan Raceway in western Michigan, so entrants arrived prepared for anything Mother Nature might unleash.. This year, soaking rains early in the week dissipated in time for twenty-five students to take on the sweeps and straights on Thursday and Friday in a training program that emphasizes track time and sportsmanship. I arrived at the track Saturday morning to find overcast skies, a brisk north wind, and a strong field of beautiful vintage cars arranged in four classes for the weekend’s race events. Saturday morning was devoted to warm-up and practice sessions, followed by lunch and a touring session. Phil Cull was good enough to give me a guided tour of the track at lunch, and I can appreciate its appeal as a teaching track. Gingerman features some great sweeping corners with a well-defined line and a few good passing zones, too. It’s also designed with really wide runoff areas to keep participants and cars as safe as possible. Saturday afternoon’s qualifying sessions set grid spots for Sunday’s events. All three fast times in this session were set in 1969 Lynx B’s, led by Garrett Van Camp. He and John Kennelley, who was 2nd fastest, would spend the whole weekend dicing in some really great racing. Alan Wong wound up 1.7 seconds off the pace in his Lynx. The B and C groups raced together all weekend, and they were next on-track. 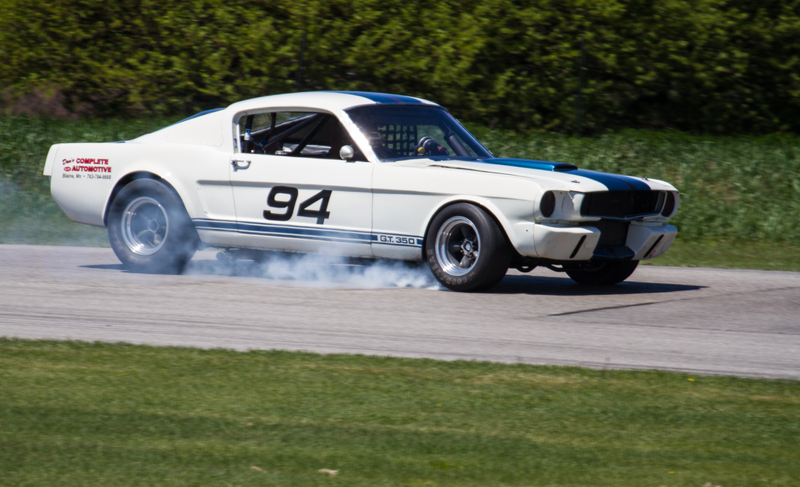 Steve Hughes had fast time in his 1965 Shelby GT350, followed by Brian Kennedy’s 1966 Shelby CT350. These two beautiful Mustangs spent the qualifying session nose-to tail, and they’d spend most of the rest of the weekend in close proximity — both sounding great screaming up Gingerman’s straights. John DeGaynor was just behind the Fords in his 1969 Devin Special. Group D featured the weekend’s quickest cars, led in qualifying by Tomas LaCosta in a 1978 Lola T492 Sports 2000 at 1:42.43. Just over a second behind was Jeffrey Porasik in his 1986 Lola S2, with Steve Beeler another second behind in a 1979 Lola T540. Wrapping up the morning, Group E qualified with Rich Stadther leading in his 1963 Elva Courier, followed by Doug Bruce in a 1959 Austin Healey Bugeye Sprite and Scott Fohrman in a 1964 MGB Roadster. Saturday afternoon concluded with Sprint races — the first real heats for the new graduates. In the Group A race, Van Camp and Kennelley held first and second flag to flag in their 1969 Lynx B’s, and Mitch Beiser filled out the podium in another Lynx. Most of the passing in this sprint occurred deep in the field, though the front-runners ran close together throughout. Steve Hughes and Brian Kennedy led the B/C Sprint in their screaming Shelby’s at the green, with Kennedy promptly jumping into the lead. 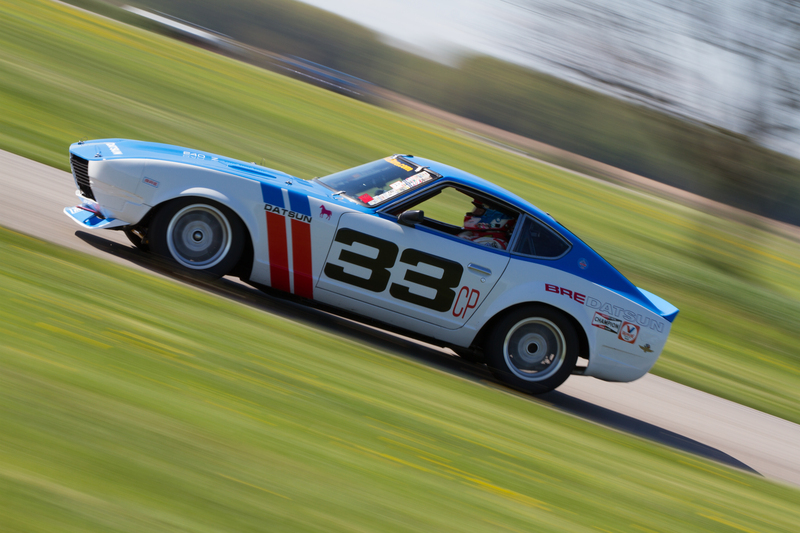 Although Kennedy looked to have this event in-hand, Kirk Blaha drove an outstanding race in a gorgeous BRE-livery 1970 Datsun 240Z, snatching the lead with three laps to go. The Group D race had a lot of action early — John F Boxhorn drove his 1984 Tiga SC84 from deep in the grid to move into 2nd by lap 2. He moved past Tomas LaCosta’s Lola to take the lead by lap 4, and LaCosta held on to finish 2nd. Jeffrey Porasik took third in his Lola S2 after a great battle with Ron Smit (1971 Royale RP9 fsv). Porasik and Smit swapped spots several times in the last few laps, but Smit wound up a couple seconds back at the flag. Saturday’s last race was the Group E Sprint. Rich Stadther (1963 Elva Courier) started from the pole, but dropped through the field on lap 8 before retiring. Scott Fohrman (1964 MGB Roadster) quickly moved up from P4 to second, and would assume the lead when Stadther retired, and Doug Bruce (1959 Austin Healey Bugeye Sprite) wound up finishing in 2nd from his outside-pole starting position after falling into 4th early in the heat, and Tim Covert (1965 Moodini SR) moved steadily up from 6th to finish 3rd. Sunday morning’s warm up events began with frosty temps, blue skies and a strong breeze that kept conditions brisk all day long. The Spridget Feature kicked off Sunday’s racing action around mid-morning. Doug Bruce (1959 Austin Healey Bugeye Sprite) traded spots with Jim Donato(1962 Austin Healey Sprite) a couple times before they settled back into their starting spots for first and second, respectively. Bruce and Donato caught lap traffic about half-way through the feature, giving Donato a chance to close up the gap, but he wasn’t quite able to get close enough to take the lead again. 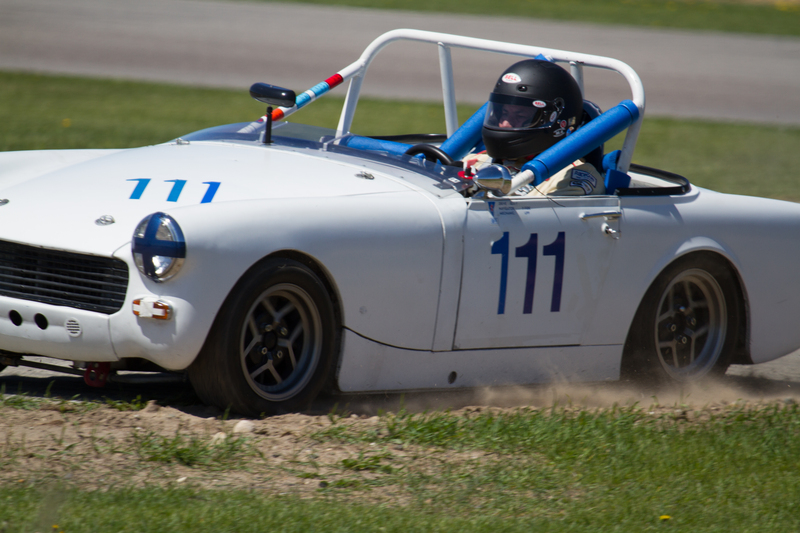 Nathan Burress held third from flag to flag in his 1959 Austin Healey Sprite, but the rest of the field was tightly-contested and full of entertaining overtakes. Following lunch and another touring session, the afternoon started with a 45-minute Enduro — a late substitution for the previously-scheduled Trans Am “B” feature. The rules for Sunday’s Enduro allowed (but didn’t mandate) stops for driver changes, and didn’t allow for refueling, so results were pretty significantly affected by teams’ choices to stop or not, as well as cars’ fuel capacities. John F Boxhorn (1984 Tiga SC84) checked out on this one, catching lap traffic by lap four, and pulling away steadily to win by close to a lap over Jeffrey Porasik (1986 Lola S2) and Sean Riley (1989 BMW 325i). Gregory Herr started fourth and finished fourth in his 1972 Porsche 914. The afternoon’s feature events started with a fantastic show from the Group A drivers. Garrett Van Camp and John Kennelley finished 1-2, right where they started in their 1969 Lynx B’s, but the lap chart doesn’t capture the tremendous battle these two gave one another. Kennelley led at the line for the first time at L7, but there were peeks to the inside and mid-lap lead changes between these two up to the point where Kennelley made it stick. The top two settled into their respective spots for a bit until Van Camp put on a late-lap charge, with the last lap offering the best racing of the weekend. I saw three passes for the lead on the last lap alone, and an all-out attack in the last corner that left Kennelley in the grass before he finally got back on track to finish 2nd. This intense, clean racing was a real joy to watch! Further back in the field, Alan Wong (1969 Lynx B) moved up a spot to take 3rd as Mitch Beiser faded back a bit, and there was more outstanding action all the way through the order — David Clardy (pre 1973 Caldwell D-13) and Chuck Buysse (1969 Lynx B) swapped 9th & 10th a half dozen times by the time the feature was done. The B/C Feature was a Ford show: Brian Kennedy (1966 Shelby CT350), Steve Hughes (1965 Shelby GT350) and Jason Pearce (1969 Ford Mustang GT) took off at the green and never budged to finish 1-2-3. Further back, Brandon Bullock (1971 MG MGB) and Jeff Fisher (1964 Lotus 26R) had a great fight for a while before Fisher pulled off late in the race. The last two features were swapped on Sunday’s schedule, so the E feature raced next. Unfortunately, this event was marred by a little get-together in corner 3 right after the start. Although both cars left under their own power, they’d both retire early. The racing at the pointy end was more composed, with Scott Fohrman (1964 MGB Roadster) and Tim Covert (1965 Moodini SR) running 1-2 from flag to flag. Richard Cook (1963 Lotus Super 7) made a nice climb into third, but pulled off on L7, leaving the last podium spot for Tony Drews (1963 Triumph TR-4). The weekend’s last event was the Class D Feature, which wrapped up the day’s action with some more great dicing. Ron Smit (1971 Royale RP9 fsv) and Steve Beeler (1979 Lola T540) made a contest for first and second early before Beeler finally secured the top spot and Smit settled into second. 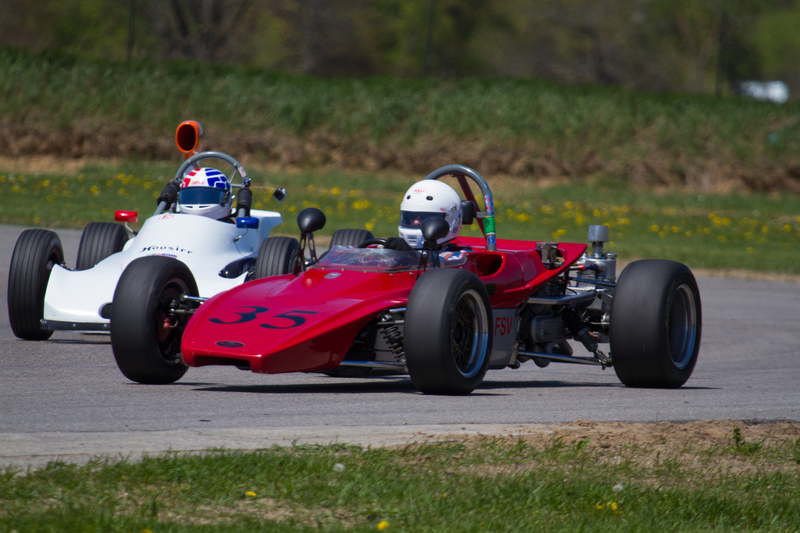 The next two spots remained contested for most of the race — Jeffrey Tschiltsch (1977 Lola T-440) and Frank Newton (1971 Formula Ford) swapped third and fourth a number of times. Newton worked his brakes as hard as he could, but Tschiltsch finally grabbed third for good on lap 11. 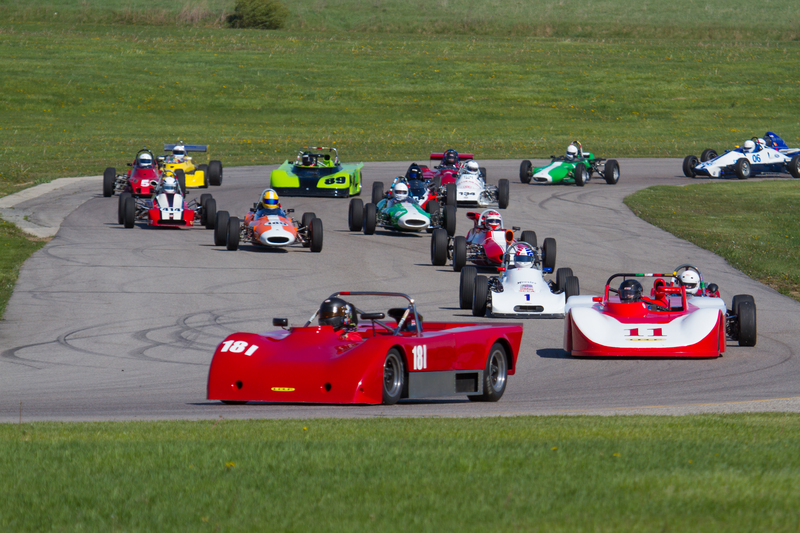 As the racers and volunteers packed up and headed for home Sunday, the weekend’s new graduates could look back on a great introduction to club racing, and look forward to VSCDA’s next event – the Blackhawk Classic, to be held the weekend of June 16-18. If the racing is as good as we saw at Gingerman, it’s bound to entertain.